A. Rules added to a MAPS policy are effective immediately. B. Fabric Watch thresholds must be converted to MAPS rules after enabling MAPS. C. Fabric Watch thresholds must be converted to MAPS rules prior to enabling MAPS. D. Changes made to a MAPS group are effective immediately. E. Default MAPS groups are updated automatically as ports go offline or online. You want to implement trunking and you are using in-flight encryption on a Brocade 6510 switch using 8 Gbps SFPs in your fabric. What is the maximum number of ports per trunk that is supported? If the master port goes offline, what will occur? A. The slave links will go offline. B. Frames on the slave links will be lost. C. The trunk group will split into multiple trunk groups. D. Frames on the master link will be lost. How many ICL trunks are shown in the exhibit? You want to implement trunking. You are using in-flight encryption on a Brocade 6510 switch using 16 Gbps SFPs in your fabric. What is the maximum number of ports per trunk that is supported? What is required to configure the trunk? A. On the 6510, you must statically assign an Area_ID to the trunk group. B. On the Access Gateway, statically assign an Area_ID to the trunk group. C. Ensure that F_Port trunking is enabled on both devices. 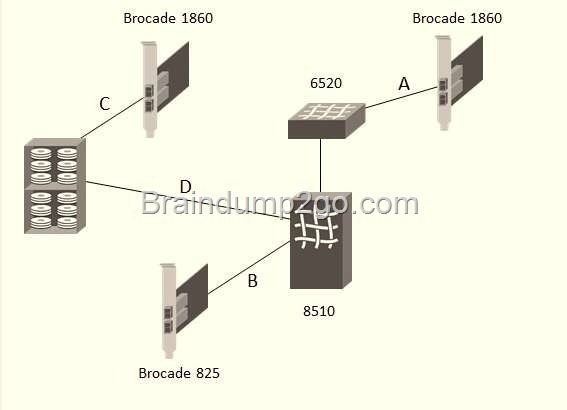 D. Ensure all ports on the Access Gateway reside in the same quad.